I went to the Anchorman 2 premiere last night so I didn't have time to blog before I ran off to get my place in the media line. I've filmed a blog on my experience at the premiere as well as a Anchorman 2 review which you can see over on my Vlogging channel. If that wasn't enough I made a outfit of the day video to go alongside this outfit. I haven't made a outfit video in SO long so I thought it was about time I made another one. This is the second part of my Topshop collaboration videos with Jess from Sunbeams Jess. We're both styling the same coat but in different colours and in two totally different ways. Go check her's out here or see mine at the bottom of this post or over on my channel page. This outfit is super simple but possibly one of my favourites I've worn recently. 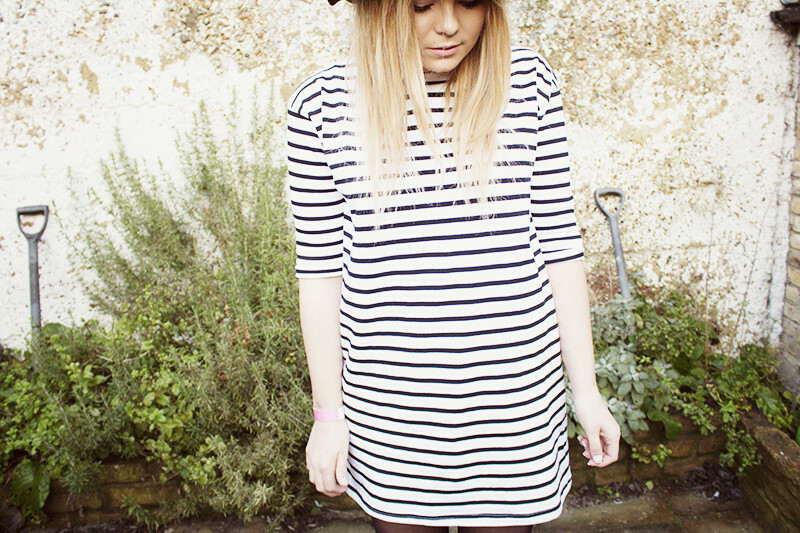 There is nothing more chic than a striped black and white dress. It ooze's Parisan cool and is such a versatile, wearable piece. This one from Topshop fluttered into my life a few days ago and it's just too perfect. Super flattering despite it's boxy shape, it also comes in red and white stripes which I also like... I paired it with my new Topshop pink coat, which again I love love love. Im so sad it took me so long to jump on the pink coat bandwagon, I can't seem to take the damn thing off now! I pulled out my old school (well last year's) Topshop Alvin Boots. I haven't worn them in a while and totally forgot how much I love them. Super comfortable, the perfect everyday boot! I think "The Pink Coat "definitely deserves a video all to itself.. so lovely! Great coat....really suits you....I want to see that film as well! Quick Q - I've got quite an hourglass shape, would you suggest I size up when ordering this dress? Is it quite narrow fitting?? Thanks! its quite baggy so I don't think you'd need to size up, mines a 10 and its a sort of loose fitting! Reading this while watching the video on my phone hahah love the coat! I absolutely love this outfit - especially the tunic. My Topshop wish list has just got longer! this is stunning I love love love the coat!!!! D'awh I love the pink coat, I still haven't found my perfect one yet! This coat is so beautiful I keep seeing so many youtubers with it and I keep wanting to buy it! WOW not only are you stunning but that outfit is amazingly cute!! 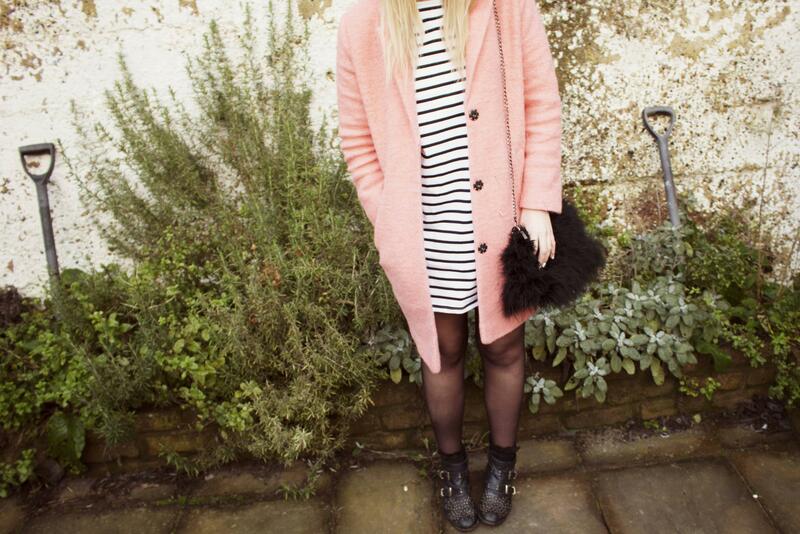 the pink coat is lush! 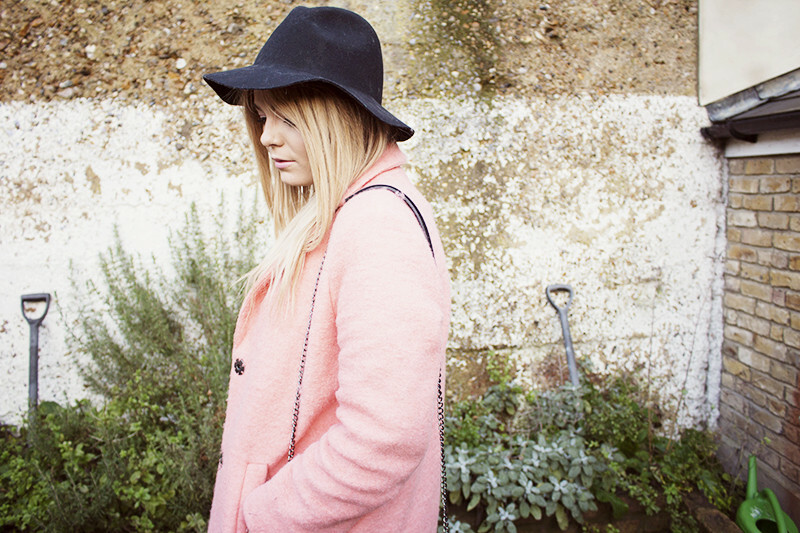 That coat is beautiful and really suits you, I'm so not confident enough to rock pink though! Aaand so can't wait to see Anchorman 2!! Absolutely love this outfit! So simple yet looks so good. Can't ever go wrong with black and white stripes! Oh gawd, another dress I absolutely MUST have! Absolutely love the coat! Gorgeous colour!! That pink coat is soooo cool and I love the dress. omg. love the entire outfit. I have serious bag envy all the time with you lily! Wow have I seen that pink coat quite a lot from bloggers and youtubers haha. It's like, the coat of the season? Kudos to Topshop! All over pink coats this season, ever since the M&S beaut! I found a fab boucle one on ebay.